Please note that we are now hosting our NAINBlog on our new website nain.org. I will no longer be updating this earlier version of the blog hosted on wordpress.com. The latest post may be found at http://nain.org/mininainews6113/ You may subscribe to this blog with your email to the left of the blog text. That way you will receive email alerts to updates and new posts. Thank you for your continued interest in the NAINBlog. Brenda Naomi Rosenberg, who presented her exemplary Reuniting the Children of Abraham program at the 2008 NAINConnect in San Francisco, reports that she has just returned from Vienna where she was the guest of King Abdullah Bin Abdulaziz for the opening of his International Center for Inter religious and cross cultural dialogue. She relates that it was an amazing experience to share interfaith accomplishments in Detroit. Her photo is from a 2-hour interview with Al Jazera and the Grand Mufti of Lebanon, Bishop Brahim of Syria and Dr Abdullah F Allheedan. 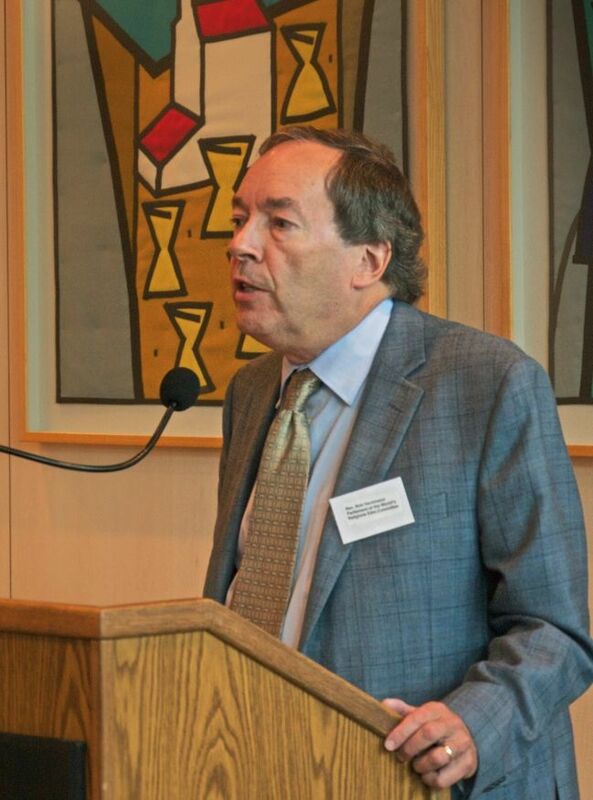 What was most impressive to many people was the media coverage presenting the positive side of connections between faith groups: David Crumm’s front page story of Reuniting the Children of Abraham in The Detroit Free Press, and RTCOA as the cover story of the Jewish News. They were very taken with the same article about the WISDOM [Women’s Interfaith Solutions for Dialog and Outreach in MetroDetroit] Book Friendship and Faith: The WISDOM of Women Creating Alliances for Peace, and her recent article “Is Peace Still Possible ?” which were featured in both Muslim Observer and Jewish News. You may also be interested in a project that Brenda has co created with Samia Bahsoun, the Tectonic Leadership Center for Conflict Transformation & Cross Cultural Communication http://www.tectonicleadership.org/. Brenda is a part of a large planning committee arranged by Gail Katz [of NAIN member org WISDOM] to envision the 2014 NAINConnect in Detroit. Another member of the planning committee, David Crumm, formerly of the Detroit Free Press and now of ReadtheSpirit.com, has organized regular meetings of Detroit area leaders in interfaith communication, the “Communicators” circle. This impressive model of interfaith connections in terms of media and broad outreach has about thirty attendees and 115 subscribers to the once-a-month Communicators newsletters. NAIN is fortunate to be able to look forward to Connect 2013 in Toronto and Connect 2014 in Detroit. We are so pleased to post that the editors at the American Library Association’s Book list have announced that Women Spirituality and Transformative Leadership has been selected as one of their top ten religion and spirituality books for 2012. The announcement will appear in their November 15 issue. We reviewed Women Spirituality and Transformative Leadership: Where Grace Meets Power in the Fall 2011 issue of NAINews. 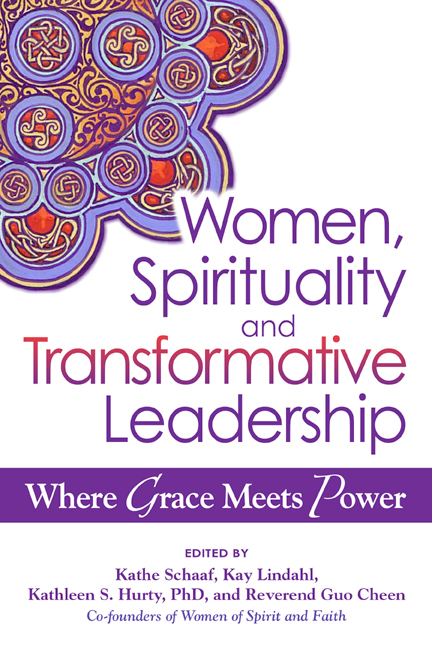 NAIN Honorary Board Member Kay Lindahl is one of the four co-editors of this significant book that explores the role of women as they reclaim a place in spiritual leadership. Karen Boyett [current member of the NAIN Board of Directors] and Jan Saeed [former member of the NAIN Board of Directors], also contributed chapters. The four editors met at the Parliament of the World’s Religions in Melbourne, which they describe as “buzzing with feminine energy”. Karen Boyett’s contribution is a very personal story of her journey to empowerment through deep [heart-centered] thinking and an awareness that she must listen to her body, not be in denial of her physical limits. The book concludes with a description of the collaborative leadership of the organization Women of Spirit and Faith, a NAIN Member Organization. The Resource section lists interfaith organizations, women’s organizations, networks for young leaders, seminaries, and educational organizations. Yesterday well over 600 citizens of the Greater Toledo Area gathered in support of the Islamic Center of Greater Toledo which was damaged by arson a week previously. We gathered in a large tent, as the Islamic Center is still too damaged to be used. As the 500 chairs filled, members of the Islamic community were asked to sit on prayer rugs on the floor, so that guests could use the chairs. Even then, the perimeter of the tent was lined with standing attendees. It was a crowd of people of all faiths and great love. On September 30, 2012, at just before 5:00 PM, a man sneaked inside the Islamic Center of Greater Toledo with a gas can and, what appeared in surveillance footage, to be a revolver. He wondered through the building and left after setting fire to the prayer room rug. Fortunately no one was there and no one was hurt. But the damage from smoke and water has affected every room of the iconic structure. The alleged perpetrator, Randy Linn from Fort Wayne, Indiana, was apprehended fairly quickly. He reportedly was disturbed by the now notorious video which has been used to incite violence overseas. He wanted to send a message of fear. I cannot say that there has not been some fear generated by this act, which has now been declared an act of terrorism and will be prosecuted under federal laws. There has certainly been much grief. But the community’s outpouring of love and support has sent a far stronger message. Dr. Mahjabeen Islam, President of the Islamic Center, graciously moderated the numerous faith and civic leaders who spoke at the service. She related that she had not realized how much she loved the Center. Her grief is like losing family members when she was a child. Sheikh Ibrahim Djemaa and Sheikh Kamal Najib offered prayers. Nihad Awad of CAIR and Dr. Maseeh Rahman, President of United Muslim Association of Toledo, spoke. Amanjeev Singh of our local Sikh community spoke of the terrorism against those who look different and expressed solidarity with his Muslim brothers and sisters. Speaking for the MultiFaith Council of NW Ohio, I quoted Dr. Martin Luther King, Jr. “Darkness cannot drive out darkness; only light can do that. Hate cannot drive out hate; only love can do that”. I said that we have developed such deep friendships across faith lines in Northwest Ohio, that it felt like someone attacked our family. I prayed that the love of the larger community would be a support to those grieving loss. Rabbi Moshe Saks quoted from his Shabbat sermon that Jews are mandated by the Torah and Jewish Law to be hospitable to the stranger. He charged us all to to never let an incident of harming the ‘other’ go by without standing up for the victim. He said to go out and tell our neighbors and friends about the Prayer Service. He asked us to challenge them, nicely, about why they were not also there. Congresswoman Marcy Kaptur reminded us of the time right after 9/11 when someone shot into the mosque stained glass window. Hundreds of people of all faiths came out and surrounded the mosque in prayer. She said she sent the photo of that prayer circle to every representative saying that this is my District. She felt that photos of this gathering would also make a statement to the world. Angela Zimman, a Lutheran Pastor, offered her congregation’s love. Ava Rotell Dustin, Assistant United States Attorney also spoke. Mahjabeen recognized and praised the fire department and all of the police and government agencies involved in the investigation. Judy Wilcox of Maumee United Methodist Church, presented herself ‘as not anyone important, just an ordinary person’. She said that her church had experienced a fire. She said that the disaster had galvanized her church, which had been dying, and now holds four services on Sunday. She offered a Prayer Quilt, pieced and knotted by loving hands of her church members. She seemed pretty extraordinary to me. Jay Weik, priest of the Toledo Zen Temple, offered a breathing practice to illustrate that we are one. Dr. Larry Conway said his son who lives in Indiana called his father to say there are still ‘some nice people in Indiana’. He pledged $1000 to help repair the mosque. Imam Farooq AboElzahab of the Islamic Center closed with prayer. Forgive me that this is a rather long post. But I think the increase in attacks against faith communities is a trend that needs countering. As Americans we need to realize that these attacks are against all of us. At stake is a freedom that is rare and precious, one that is the very foundation of what this country means. I am proud that we were able to gather in peace yesterday to support our brothers and sisters. I also know that as interfaith community builders, we still have much work to do. I hope that we all will have the courage and stamina to continue. I would like to recommend this local news story. It is a remarkable personal account of one woman’s [a dear friend’s] grief and overriding faith. “Mosque school’s kindergarten teacher talks of her grief over fire’s damage: Faculty member, on staff since start, reveals she ID’d suspect to police”, by TK Barger, BLADE RELIGION EDITOR – click here. The Interreligious Coordinating Council in Israel and the Scarboro Missions Interfaith Department https://www.scarboromissions.ca/Golden_rule/index.php [NAIN member org] (Toronto , Canada ) are pleased to announce the publication of a Hebrew-language poster featuring texts of the Golden Rule in 13 religions. Individuals and organizations are permitted and encouraged to reproduce this poster in print and electronic form for educational purposes. Please feel free to post the poster on your website. To view or download free of charge, click link below. Paul McKenna, Scarboro Missions Interfaith Dept., Scarboro Missions Interfaith Dept. NAIN Member Organization Edmonton Interfaith Centre, in partnership with the City of Edmonton, joins the Partner City Network of the Parliament of the World’s Religions. 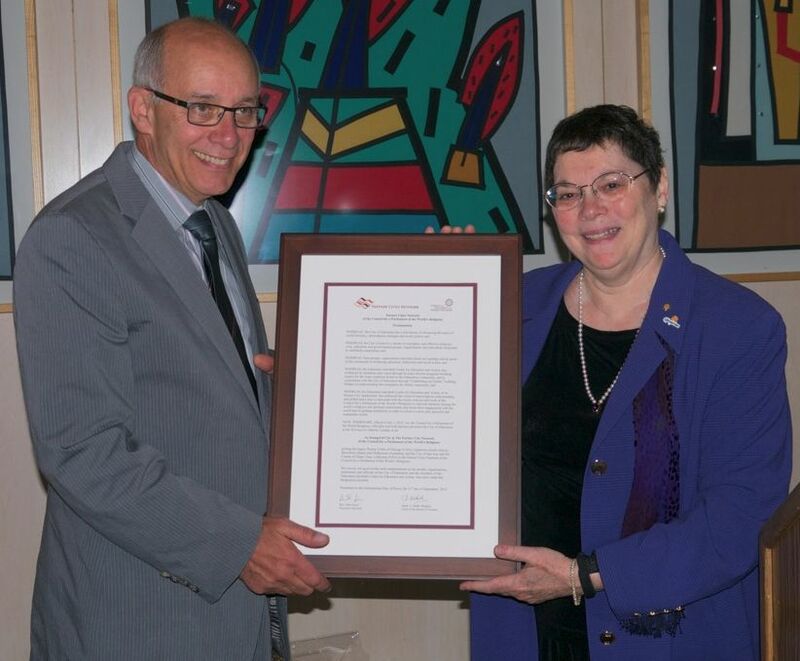 At a ceremony held in Edmonton City Hall on Friday September 21st, 2012 (International Day of Peace) Parliament of the World’s Religions Trustee Emerita Helen Spector presented Mayor Stephen Mandel with the Partner City status Proclamation. NAIN Chair Rob Hankinson presided over the ceremony. With so many challenges around the world relating to some religious issue or faith tradition, such as the violence in Libya and Egypt or the Wisconsin shootings at a Sikh Worship Service, Arizona Interfaith Movement is hosting something positive, educational, non-political, and fun, Experience Interfaith, Tuesday, October 23, 2012, from 5 – 9 PM. The theme this year is “Peace in ACTION”. 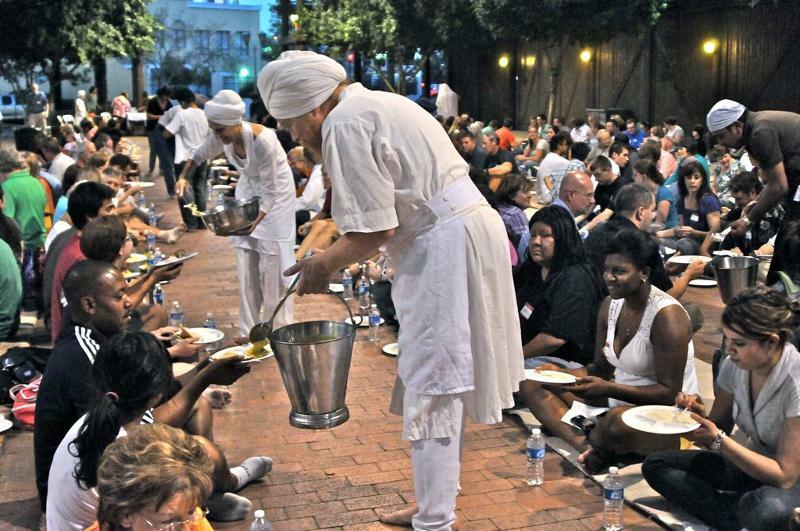 A Faith Fair Reception is followed by a traditional Sikh Langar, a vegetarian meal in the Free Community Kitchen tradition of the Sikh Faith. Small group discussions will follow the meal to formulate a collective Call to Action. Details may be found at http://myemail.constantcontact.com/-Experience-Interfaith—-your-invitation-.html?soid=1101822920536&aid=paSjaIaLO2A.